You are here: Home / What is Ionized Alkaline Water? 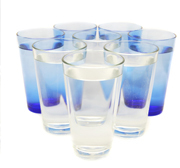 Ionized water helps to balance your body’s pH which is needed because most Americans diets are too acidic. Acidic environments provide ideal characteristics for disease to manifest and thrive. The human body, in an attempt to decrease acid levels, will absorb calcium from the bones and magnesium which is needed in the heart. It turns acidic wastes into solids and stores them in fatty tissues resulting in the hardening of the arteries and excess weight. Chanson Alkaline Water Ionizers produce water that has five to six molecules per cluster which is smaller than regular water molecule clusters of about 15. This smaller particle size allows the water better access to smaller pathways through your tissue – your water literally becomes wetter! This form of “micro water” is more hydrating than conventional water and makes more oxygen available to your cells. This can accelerate your metabolism and boost your energy. Hydroxyl ions (OH-) in the ionized water have been electrically charged to seek out and neutralize free radicals. Free radicals cause damage to cells and bring about disease and premature aging. The result from drinking ionized alkaline water is a body rich in health, oxygen and energy. If you slow the water flow down when using a water ionizer, you will notice that your glass will have hundreds of very small bubbles floating in it. These bubbles are caused by the hydroxyl ions and are visual proof that your water now carries a negative ORP (oxidation reduction potential). A high positive ORP (such as found in most bottled and city water that have excess H+ ions) causes oxidation and accelerates the aging process. In comparison, when you drink clean, ionized water, you are drinking a powerful, natural antioxidant that cleanses on a cellular level. If you make fresh organic juice you will have an antioxidant with a -250 ORP. Ionized alkaline water from a Chanson Water® machine will give you between -250 and -810 ORP depending on your water source, and you will be able to drink and enjoy as much as you need throughout the day without any negative side effects or added calories. 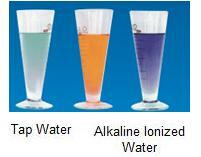 If you prefer to drink coffee or tea, try making it with Chanson ionized alkaline water. Not only will what you drink be healthier but the ionized water will also enhance the taste and flavor more than standard water. Here is a demonstration showing how Chanson ionized alkaline water powerfully penetrates tea and pulls out the flavor and nutrients without heat. 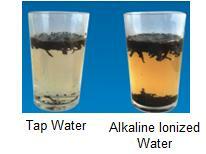 We placed one tea bag in a glass of cold tap water and another in a glass of cold Chanson ionized alkaline water. The difference can be seen immediately – the photographs are shown just after the tea is submerged in the water and stirred. The ionized alkaline water, even in a cold state, produces drinkable tea. The cold tap water could not pull much from the tea. If your water can’t penetrate tea, how well is it penetrating your cells? Tap Water: The color of the water did not change after the tea was put in. Ionized Alkaline Water: The pigment of the tea dissolved rapidly after tea is added and the fragrance of the tea can be smelled. 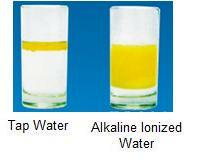 Chanson ionized alkaline water has smaller water clusters, causing the tea molecules to dissipate more quickly. The water molecules quickly penetrate the tea bag the same way they would your cells, hydrating your body more efficiently. Tap Water: Add peanut oil or sesame oil to a cup of water and gently shake the cup – the oil will float to the surface of the water. Ionized Alkaline Water: Add peanut oil or sesame oil to a cup of ionized alkaline water and gently shake the cup – the oil will be emulsified in the water. If it will do that to oil, imagine what it might do to cholesterol. Additionally, the body stores crystalline deposits in joints that create gout, inflammation and stiffness. As our body’s communication channels break down, cancerous cells may appear, and organs can start to degenerate. Ionized alkaline water neutralizes accumulated acid waste (which has low pH) with its alkalinity (the opposite of acid, high pH). The neutralization helps to restore balance without utilizing energy and valuable minerals that are needed elsewhere. Keeping your body alkaline supports your immune system which is your first line of defense in fighting any sickness or disease. Tap Water: The water with the reagent drops is blue; add high concentration of your favorite brand of alcohol spirits and the water will soon change into yellow which is acidic. Chanson ionized alkaline water can neutralize the acidity in the body, and minimize the risks caused by drinking alcohol, colas and other acid beverages. In Japan, ionized alkaline water has long been known as a “hangover cure” because it neutralizes alcohol in your system. Chanson ionized alkaline water improves the taste and quality of fruits and vegetables by removing the chemicals and pesticides. Live foods quickly loose their energy after being picked, even organic foods can taste better and have more measurable energy and antioxidant power restored to them by soaking briefly in ionized alkaline water. Watch this video and see how tomatoes were revived and how their tastes and freshness improved by soaking in ionized water. Drink a lot of soda? Read this for the truth about just how harmful soda really is.